It’s been a while since the public has been faced with a new batch of Table Scraps. The summer of 2015 was all about making More Time for Strangers – the band’s debut full length, which left the UK head banging to a landslide of rough and rowdy garage rock. Fast forward nearly two years since then and while the Birmingham, UK band is still cranking up the gain knobs and doing the DIY scene proud, Table Scraps have undergone a few changes and experienced a few noteworthy milestones along the way. Straight away, established fans of the fuzzed out duo will notice a new third name in that line up list. Known simply as TJ, this bassist dove into the Table Scraps laid before him and has helped to round out Abbott and Twist’s fierce sound with some good old fashioned rumble in the low end on bass. Though the band has never let up in the engagement with the music scene or any of their international support thanks to the wonders of social media, following the release of the single “Motorcycle (Straight to Hell),” in August 2015, the band took things a little easier when Abbott was faced with the need for skeletal surgery. Now fully recovered and with TJ in the fold, Table Scraps are re-emerging with more force and creativity than ever before. New single, “My Obsession,” which is part of a 7-inch split with fellow Birmingham rockers, Black Mekon, on their 45 Consortium Series, shows the trio’s new sound but will be simultaneously reassuring to those looking for a fix of the noisy punk they know. The track, which runs slightly over three minutes, perfectly displays how an integration of new instruments and players need not shift the fundamental style or arrangement of a group’s original sonic character. Abbott and Twist didn’t decide to get fancy and they definitely didn’t decide to clean things up. The flow of this song is slower but thunderous, as Twist’s drumming alternates between low and loose kick and tom, to the snap of her snare, all while repeating a simple pattern of eighth and quarter notes that sets the song in a steady marching, almost drone-like motion. This structure is only further built upon once Abbot’s minor 2nd riff and TJ’s matching minor bass line come into play. Check out the song below, as part of a clever 3D video made by Twist with a little help from old school projection and color play. It’s caters to and aligns with Table Scraps’ appreciation for horror and old fashion, b-roll cinematography. Topped off by the final element of mildly scratchy, snarling vocals belting out the titular phrase (My obsession, my obsession, my obsession. My obsession with a girl like you), from there the track maintains a pretty steady state of stepwise undulation in the vocal melody; never deviating from the minor key motif its built to that point and keeping this established loop relatively undisturbed with plain syllabic “ahhs” singing the intervals between verse lines. Hooked in with this pattern of wave-like movement, repetition reigns beyond the beginning of “My Obsession,” having the start of each verse echo its key focus four times atop the melody’s slow, interval see-sawing (Disappointment, disappointment, disappointment. Disappointment in the things you say). Those who consider themselves fans of grungier punk and drone style songwriting are liable to fast find enjoyment in the song, as the tonal qualities extracted by Twist, Abbott, and TJ, combined with the kinetic energy of the track’s hook align with both niches. Twist’s kit in particular, comes across very open; as though she was recorded with a good distance placed between herself and the mics or, at the very least, with more emphasis placed on overhead and room mics, giving that “live” sound to each hit. During the instrumental bridge, the band breaks the established rhythmic loop for just so long and it’s enough to let Abbott stretch the muscles of his guitar with distorted and wah-like effects. Notes virtually never venture outside of a few half steps from one another but the leaps from one warped effect to another allow the band to let go just a bit more and furthermore, set the stage for imaginings of what can be done with that bridge during a live set. The options are many, from simple extension, to any amount of layering to dirty up the tone even more, dependent on whatever Table Scraps might be feeling from one night to the next. The track as a whole is nothing compositionally daring, even with the embrace of rugged and coarse production. 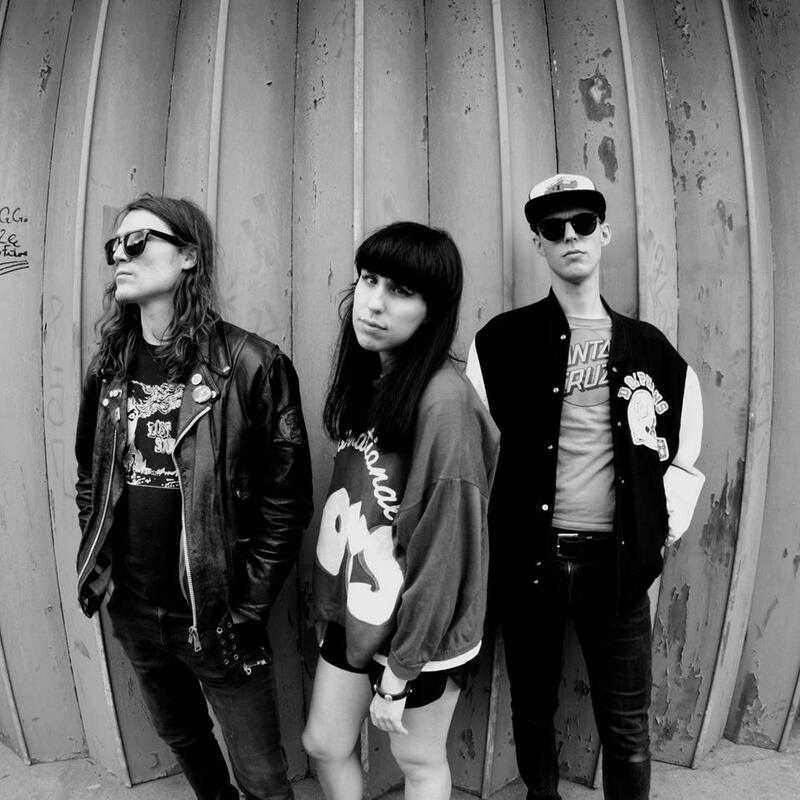 However, as a group that’s just settling into and out of two distinct kinds of transition, Table Scraps have made something that can undoubtedly get garage appetites revving up again and once the three mates have had time to really lock in, whatever comes next is likely to make them seem like anything but just their namesake. 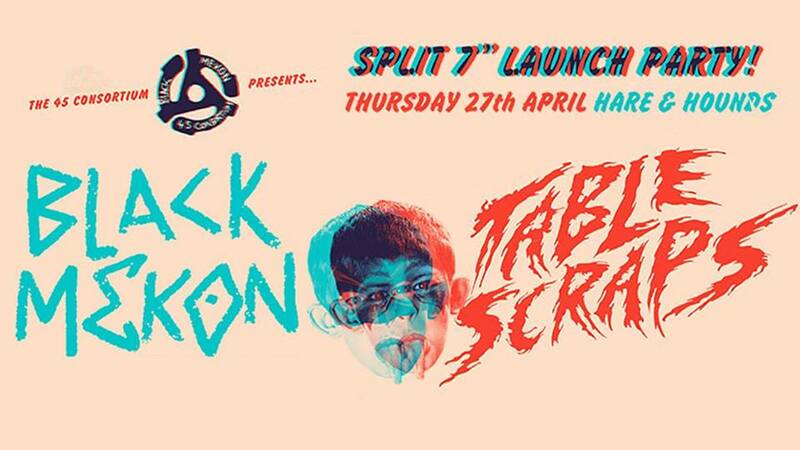 Those in and around Birmingham can get up close and personal with Table Scraps and Black Mekon at the launch of their split 7-inch! Full show details below.